Archives of Oral Biology operates a web-based submission and review system. Please register at http://ees.elsevier.com/aob to submit a paper. The aim is to be inclusive and multidisciplinary and papers are also welcome in the fields of structure and function of craniofacial tissues over the whole range of vertebrates including studies concerned with palaeontology and comparative anatomy. 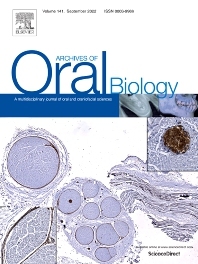 Archives of Oral Biology will also publish expert reviews and articles concerned with advancement in relevant methodologies. The journal will only consider clinical papers where they make a significant contribution to the understanding of a disease process.